A new oxymoron is born. After non-alcoholic beer and decaf coffee, the world is finally ready to welcome “highless” marijuana. Israeli scientists working at Tikkun Olam–the first and largest medical cannabis cultivator in Israel–created a new variant of the plant capable of easing patients’ pain without getting them high. All of this happened recently near Tsfat and, let me say, there couldn’t have been a better place for it. Located in northern Israel, Tsfat is the birthplace of kabbalah, Jewish mysticism. Two questions arose in my mind when I read about the news. How did they do it–and why? Let’s start with the second question. Like many, I thought that the high produced from cannabis was the reason why it is used with terminal patients and people suffering from terrible pain. Apparently, this is just partially true. Cannabis has more than sixty constituents, called cannabinoids, two of which are tetrahydrocannabinol (THC) and cannabidiolol (CBD). In spite of their extremely long, highly scientific-sounding names, their goals are quite simple. THC is the component that affects the brain’s receptors and thus, is responsible for the well-known “high” effect caused by smoking marijuana. On the other hand, CBD is the component with anti-inflammatory effects. Scientists at Tikkun Olam realized that, by taking out the THC from the cannabis plant and enriching it with CBD, they could obtain a “highless” marijuana, also known as Avidekel. I talked to Zach Klein, head of development at Tikkun Olam, to find out more; below is a lightly edited transcript of our conversation. When did your team start its work on Avidekel? About three years ago. The work we do is based on agriculture and cross fertilization of plants—that is the basic process we are working on. One reason why we started to work on medical highless marijuana was the pressure we received from the Hebrew University of Jerusalem. They really wanted the CBD plants. Can you explain in a few words the different uses of CBD and THC? CBD can be used much more as a medical instrument for therapy; THC is also therapeutic, but has an immediate effect on symptoms, which CBD doesn’t have. So, there is a big difference. Why bother creating a marijuana plant without the high effect? When I heard about the idea of creating Avidekel, a CBD plant without THC, I thought, “Why?” Since then, I followed the scientists’ research–for example, now I am in Germany waiting for the opening and welcome reception of the ICRS Conference, the International Cannabinoid Research Society. I followed the conferences and the scientists to see and hear what they learned and what they knew about this plant. In the last few years they talked a lot about CBD, about cannabidiol, and it is very interesting. However, whatever I heard was almost exclusively theory: All the research had been done on animals, and only in laboratories, despite the fact that cannabis was already known as a good thing to use for medical purposes. A year and a half ago, we started a project in a nursing home. We made cannabis available for the institution to give to their patients. Of course, they are not people that want to smoke in order to get high; they do it as part of their medical treatment. We were using a very high THC plant with almost no CBD. For the patients in the nursery, it was sometimes so much THC that they couldn’t cope with the mind-altering effect. Some of them couldn’t use the medicine, the cannabis, at all. When we started using CBD, the picture changed. Patients who couldn’t stand the effect of THC were able to use this cannabis with CBD. One of the things cannabidiol is capable of doing is lowering the psychoactive effect of THC. Used by itself, CBD is an anti-inflammatory and lowers pain when it comes from an inflammation: Lowering the inflammation enables a lower level of pain. Why should someone use Avidekel rather than a normal pain killer? Some painkillers have side effects: They can cause addiction and are poisonous for the human body. Patients with kidney-related problems can’t use the non-steroidal anti-inflammatory drugs. On the contrary, Avidekel has no known side effects. Why should someone use Avidekel rather than a normal pain reliever? Have you already tested Avidekel on humans? If not, when are you going to start? We have tried it on a few people and we got good responses. It is not the same kind of response as the one obtained from normal marijuana. It doesn’t have the dramatic immediate effect caused by THC, but after 10 days or two weeks, people start to feel better. We are now approaching clinical trials with Avidekel. Of course, it is going to take a few months, but we already have the initial approval by the Ministry of Health and the physicians who would work on it. Should patients be free to choose between tradition marijuana and Avidekel? Of course, they should have the right to choose. We don’t offer just two different strands of medical marijuana. We have several kinds of plants with combined percentages of CBD and THC. In this way, patients can try different typologies and choose the best for them. What kind of patients benefit from either regular cannabis or Avidekel? People who use medical cannabis and Avidekel come from several different kinds of diseases. Pain can have many different causes. Patients with inflammatory bowel diseases, like Crohn’s disease, have a very difficult life. When they use medical marijuana, with THC, they can feel the difference but sometimes the psychoactive effect makes it impossible for them to have a normal life. If we make them feel better but they are unable to work or leave their houses, we have only accomplished half of our goal. Now, we are able to give them a high-CBD, low-THC plant that can give them relief, without a high psychic activity and bring them back to their normal lives. The build-up to the Olympics is always a busy one for those participating. The athletes need to be in good shape and well prepared in order to succeed, the flag-bearers for the opening ceremony have to be chosen and heads of state are called to take photos with their national teams. Thumb up for President Peres! The second issue regards the initial decision made by the BBC Olympics 2012 website, to list Jerusalem as the national capital of Palestine, rather than of Israel, leaving a blank space under the name of the Israeli capital. Requests for an explanation came from all over the country, including from the press and politicians. Bewildered by the BBC’s decision, Prime Minister Benjamin Netanyahu used Facebook to launch an appeal to all supporters of “Israeli Jerusalem.” This social network campaign is called “Jerusalem is the Capital of Israel,” and already has almost 20,000 fans. After this protest, BBC Olympics 2012 decided to move Jerusalem to Israel, living a blank where Palestine has formerly had a capital city. Complicating the situation, the BBC website located Israel in Europe, while Palestine remained in Asia. Definitely, thumbs down for BBC! However, the most serious problem relates to the 40th anniversary of the Munich massacre, in which 11 Israeli Olympic athletes and coaches were taken as hostages and killed. The International Olympic Committee is refusing to observe a one-minute silence, requested by the state of Israel, in honor of the people who lost their lives in that terrible event. Israel has not given up on this, and the quarrel over whether or not there will be a moment of silence remains open, with many public figures–including Barack Obama, Hillary Clinton, Mitt Romney and NBC sportscaster Bob Costas–joining the call for a moment of silence. Iranian athletes let the world know that, in the event that the Committee decides to respect the Israeli request, they will keep the silence along with the rest of the world. I am holding my thumbs on this, and await Friday! In the meantime, still shocked by the terrorist attack in Bulgaria, Israeli and British forces are working together to assure the highest level of security for all athletes at the games. Before checking out the Israeli Olympic team of 2012, let’s have a look at how Israel did in past games. Israeli athletes seem to be especially good at canoeing, judo and sailing. In the last event, they won two bronze medals in 1996 and 2008 and a gold in Athens in 2004. In 1992, the Israeli team earned one silver and one bronze medal in judo, and another bronze in 2004. Finally, during the 2000 Sydney Olympics, Israel took the third spot in canoeing. To summarize, overall they have won one gold, one silver and five bronze for a total of…..seven medals. Come on Israel, you can do better! I’ll keep my fingers crossed for you! This year’s Israeli team is composed of 37 members, 19 men and 18 women, who are set to compete in several fields. Among these are badminton, artistic gymnastics, rhythmic gymnastics, judo, sailing, shooting, swimming, synchronized swimming and Tennis. Two members of the Israeli team have unusual stories: Donald Sanford and Zohar Zimro, two athletes with very different stories but two things in common–their love of sports and an acquired Israeli citizenship. Sanford was born in the United States and his Olympic journey started at Arizona State University. As a student there, he met Danielle, an Israeli girl from Ein Shemer, a kibbutz in northern Israel. The two fell in love and got married. Even though Sanford was not raised as a Jew, he got to know the religious traditions and culture of Israel through his wife’s family. Sanford eventually decided to make aliyah, obtaining an Israeli passport and citizenship. After beginning his career in the 1500-meter dash, Sanford soon switched to the 400-meter dash, in which he will compete this year. Zohar’s story is different from Sanford’s, but similar to those of other Africans who, as he did, emigrated from Ethiopia to Israel in the late 1980s, following their Zionist dream. The marathon runner described his life as a “Cinderella story” which brought him closer than ever to fulfilling his biggest dream: “achieving something historic at the Olympics” in order to be remembered forever in Israel. What to say? Yalla, Zohar! Yalla! The most famous character of the Israeli Olympic team had a bit of drama: Baby Bamba, the vetoed Israeli mascot. The cartoon was initially chosen to be the mascot of the 2012 team, but in March, it was removed from the list of mascots. Its fault? Looking too similar to the logo of a popular children’s snack. But Israelis aren’t the only ones with “Olympic” problems. July is the month of Ramadan–so it won’t be easy for all the Muslim athletes who will need to compete on an empty stomach. those found in non-Jewish sources. I love going to the New York Times homepage to see an article about making kosher cocktails. Or the article about playing gaga at Jewish Summer Camps. Or the one about how Haredim cope with the summer heat. You always hear questions like, “If there are so few Jews in the world relative to other religions, why do we keep winning Nobel prizes?” As of 2011, Jews make up around 0.2 percent of the world’s population, and yet 22 percent of Nobel recipients between 1901 and 2011 were Jewish. Maybe my fellow intern Lily Shoulberg can help us out with that one. But what I’d like to know is if there are so few Jews in the world, why do we keep popping up in the news? Granted, major newspapers aren’t going to be able to choose whether or not to write about the conflict in the Middle East and Israel’s relationship with Iran, but I’m talking about the more quirky articles. Like Mark Oppenheimer’s column on a kosher Starbucks website. 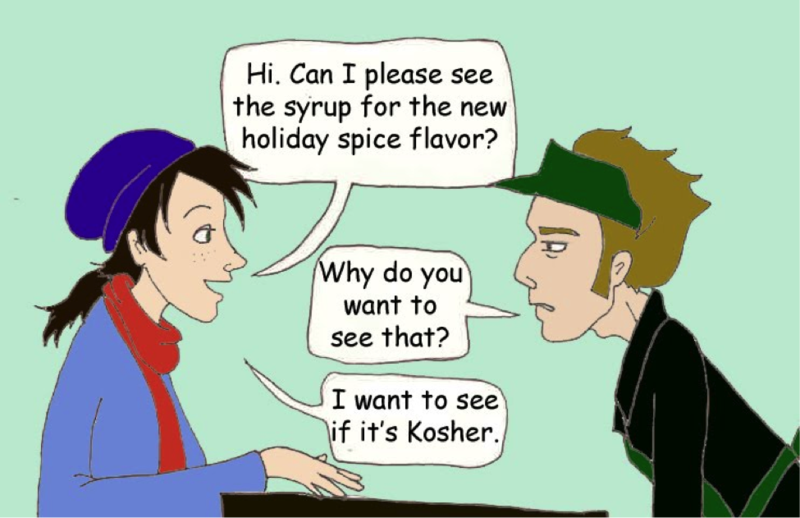 When I asked Oppenheimer how he came up with the topic, he replied, “I was in a Starbucks, and I saw an Orthodox fellow, and I had noticed this same man at a different coffee shop in New Haven, and I got curious about it.” He tweeted about it, asking if Starbucks was kosher, and someone responded with the Chicago Rabbinical Council official document on Starbucks’s kashrut. After searching some more on Google, Oppenheimer stumbled upon Ort’s website. So what it all comes down to is the fact that Jews don’t agree on much of anything. Ever since the Jews fought the Seleucid Greeks in the second century B.C.E., the Jewish People was divided into different sects or movements. At first we had the Essenes, Sadducees, and Pharisees. Then came the Karaites. About a thousand years later, Judaism gave rise to the first modern movements—the Chasidim and the Mitnagdim. 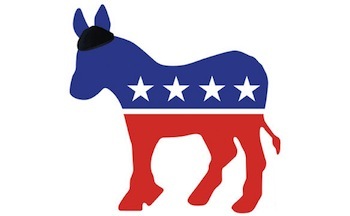 Today, the number of Jewish sects is endless: Ultra-orthodox, modern Orthodox, Conservadox, Conservative, Reform, Reconstructionist, Humanist, Renewal, and the list goes on and on. Waving at me from across Castle Street was Violeta, a middle-aged woman with a broad, fair face and blond hair, her solid body squeezed into a tight, fashionable jacket and matching skirt. We sat down at a checkered tablecloth and ordered a decidedly un-Jewish meal of shrimp salad, then raised our wine glasses. “L’chaim!” I said, offering the traditional Jewish toast. To life! “I sveikata!” she responded in Lithuanian. To health! I’d come to Vilnius, the capital of Lithuania, to study Yiddish and explore my Jewish family’s past. In so doing, I felt in some ways as if I was stepping into enemy territory. I knew that the Holocaust had been especially swift and thorough in this Baltic land. Some of my own family members were among those herded into ghettos or marched into the woods to be shot. Growing up, I’d been taught to distrust–even hate–Lithuanians. “They were among the worst,” I was told. A friend had connected me to Violeta, who was neither Jewish nor a professional history-confronter. Just an ordinary citizen. I’d written and asked if she’d talk to me about how her country was engaging with its 20th-century history, and she’d responded warmly, eager to help. I knew something about the deportations Violeta was talking about. Before the German invasion, Red Army tanks rolled into Lithuania, and tens of thousands of people–Jews and non-Jews alike–were sent into exile. A knock at the door, and entire families–men, women and children–were ordered to pack what they could carry, herded onto freight trains and resettled in the east. Now it was my turn to look away. At nearby tables, other city residents were talking and eating. No doubt some of them were also seething with such feelings. I, too, was seething, I found. “The Jews” had sent her people to Siberia? How could she say that? In the turbulent time before the German invasion, and again after the war–when Lithuania became a republic of the Soviet Union–a small but significant number of Soviet administrative posts were occupied by Jews, I knew. Although Jews were a small minority of government officials, and although only a small fraction of Jews were Communists, they stood out in the eyes of non-Jews. I struggled to focus on what Violeta was saying. It was hard for me to listen to her as she placed the massacre of my people alongside the suffering of hers. It was hard for me to hold in my head the reality of non-Jewish suffering side by side with Jewish suffering. I hated hearing my people blamed for the suffering of hers. This must be what people meant, I realized, when they said that half a century under two regimes had turned Lithuania into a cauldron, bubbling and boiling with competing martyrologies. Now Violeta was slicing the air with her hand. “I want to say,” she declared, “that the Lithuanian people throughout history have loved other nationalities.” She paused. “That is, normal Lithuanian people loved others. The local men who helped round up Jews in 1941 were not normal people. Since the collapse of the Soviet Union in 1991, I’d heard, buried truths about both the Soviet era and the Nazi era were beginning to be exhumed. Educational initiatives were beginning to blossom. A new discourse had begun. In fact, my conversation with Violeta was a part of that discourse. And if the conversation was not easy, I reflected, I was nonetheless glad to be having it. To understand the land of my forebears, I had no choice but to open my ears. To do my part in preventing future genocides, I had to seek out ways to listen, to respond, to move forward from the fears and hatreds of the past. So I turned back to Violeta. The dialogue was beginning. Ellen Cassedy is the author of We Are Here: Memories of the Lithuanian Holocaust. So we have two camps representing the extremes of Israelis and Palestinians. But let’s take a closer look at these camps. We’ll start with camp “We will live honorably” in Gaza. Now that the United Nations Relief and Works Agency (UNRWA) no longer runs summer camps in Gaza, “We will live honorably” is the only option for kids in Gaza. 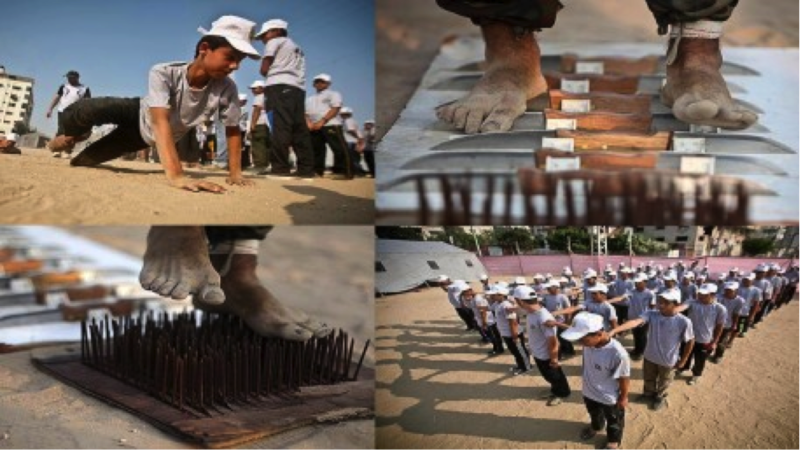 This Hamas-run camp attracts around 70,000 kids from across the Gaza strip. According to one of the camp directors, Omar Aql, the camps try to “strengthen the importance of volunteer work and create a clean social environment.” For example, campers participated in a campaign to clean the Nuseirat beach. But then there are some disturbing camp activities as well. Campers are introduced to a model of an Israeli security prison in order to “reenact the daily suffering of Palestinian prisoners,” according to the Palestinian Maan news agency. The “prison” consists of an investigation room, a detention room, a confession extortion room, a solitary confinement room, a courtyard and an infirmary. At Camp “Hilltop Youth,” the campers partake in some disturbing activities as well, learning krav maga in order to fight against any Arabs that may happen to attack them. The girls are also introduced to extreme living arrangements, spending four days without electricity or running water. Unlike the “We will live honorably” camps, the “Hilltop youth” camp is one of many summer camps available in Israel. An Israeli child can have a normal camp experience at Camp Kimama or Camp Tapuz. Both campers have been taught to devote their lives to their nation. They are instilled with a great sense of patriotism—to the extent that they will fight no matter the cost. According to Ma’ariv, the goal of the “Hilltop Youth” camp “is to train and recruit the next generation of warriors to settle the hills.” They even bring in speakers from the settlement movement, such as MK Michael Ben-Ari and Itamar Ben-Gvir. Yes, that sounds just as extreme as training Gaza youth to be Hamas militants, but there is one crucial difference between the two: the camps’ relationship to their nation. The camp in Gaza is organized by Hamas. As the ruling power in Gaza since 2007, Hamas is not only condoning such camps but is funding and running them. The camp in Ramat Migron, on the other hand, is run solely by extremists. According to Ma’ariv, “security forces came to the outpost tens of times and destroyed the wooden shacks that the youth had built,” but each time the youth return to rebuild it. The State of Israel is not supporting extremists. They are trying to stop them. In fact, Ramat Migron is scheduled to be evacuated by August 1. You can make an argument that likens these two camps, and you could make an argument that contrasts the two. What it comes to at the end of the day is does the camp represent an extremist minority or an extremist people.